Purpose: The Prof. Ranjit Roy Chaudhury committee report recommended the accreditation of Institutional Ethics Committees (IECs). Rule 122DD of the Drugs and Cosmetics Act (and Rules) mandates that only registered ECs can accord approval for regulatory studies. We evaluated the current status of registered, reregistered, and accredited ECs in the country to assess the impact of both the recommendation and rule. Materials and Methods: Websites of stakeholders-the Central Drugs Standard Control Organization (CDSCO), National Accreditation Board for Hospitals and Healthcare Providers (NABH) were assessed. Information on registration status was then compared with regulatory clinical trials in the Clinical Trials Registry of India, population demographics of all states, and the Medical Council of India recognized postgraduate medical colleges in the various states. Results: A total of 1268 ECs were registered with CDSCO. Of these, 1008 (79.5%) were institutional and 256 (20.18%) independent ECs. A total of 499/1268 (39.4%) ECs were reregistered. Of which 449/499 (90%) were institutional and 50/499 (10%) were independent. Institutional ECs were five times more likely to be reregistered with CDSCO relative to independent ECs (cOR 4.52 [3.12, 6.54], P < 0.0001). A total of 15/233 (7%) applications to NABH had received accreditation. A wide skew was seen in the distribution of ECs across various states as also their oversight of regulatory clinical trials. Conclusions: Registration and reregistration of ECs along with accreditation is not commensurate with the needs of the country at this time and must be vigorously promoted. Ethics committees (ECs) safeguard the rights, dignity, and well-being of research participants by reviewing all aspects of clinical research, approving its initiation as well as providing continued oversight. An important amendment was made to the schedule Y of the drugs and cosmetics act (1940) and rules (1945) on February 8, 2013, with the introduction of rule 122DD issued by the ministry of health and family welfare, Government Of India. This rule states that “no ethics committee (EC) shall review and accord its approval to a clinical trial protocol without prior registration with the licensing authority i.e., the Central Drugs Standard Control Organization (CDSCO) in India.” The rule also states that the registration of an EC is valid for 3 years and needs to be renewed every 3 years. The report of the Prof. Ranjit Roy Chaudhury Committee in July 2013 recommended the accreditation of institutional ECs (IECs), principal investigators (PIs) of clinical trials and centers desirous of carrying out clinical trials. It was believed that the accreditation of ECs would play a pivotal role in improving the protection of research participants., The CDSCO has tasked the National Accreditation Board For Hospitals And Healthcare Providers (NABH) to accredited ECs in India. With this background, we carried out the present study with the primary objective of assessing the current status of registered, reregistered and accreditated ECs in the country to evaluate the impact of both the rule and the recommendation. Our secondary objectives were to assess whether the numbers of ECs state wise was commensurate with the population of the state. Since it is mandatory to register clinical trials which are regulatory in nature at the Clinical Trials Registry of India (CTRI), we also evaluated the number of such trials per state vis à vis the population and registered ECs of that state. We also wanted to assess whether the Medical Council of India (MCI) recognized medical colleges (teaching postgraduate [PG] courses and therefore conducting clinical research) had ECs that were registered. Exemption from the review was received from the IECs since the information collected for this study is freely available in the public domain (EC/OA-158/2017). Population demographics of the country were obtained from http://censusindia.gov.in/Data collection was started after EC exempted the study on January 12, 2018 and all databases (except the website of the MCI) were last accessed on February 28, 2018. From the websites, we assessed: (a) the total number of independent and institutional ECs registered-both initially and reregistered and their accreditation status, (b) The state-wise distribution of all ECs, (c) Time (range) in days to registration of independent and institutional ECs, (d) Population of states versus number of registered ECs, (e) Number of regulatory trials registered in CTRI per state versus the number of ECs registered per state, and (f) Number of MCI recognized colleges versus number of colleges with registered ECs. Both descriptive and inferential statistics were applied. Categorical data (Number of independent and institutional ECs registered and reregistered, the population of states, number of regulatory clinical trials in CTRI and number of MCI recognized medical colleges, number of NABH accredited ECs) are presented as proportions. Comparison of (a) Population of states versus number of registered ECs, (b) Number of regulatory trials registered in CTRI per state versus number of ECs registered per state, and (c) Number of MCI recognized colleges versus number of colleges with registered ECs was done using descriptive statistics. Quantitative data (time to initial registration of the ECs) are expressed as median (range) after assessing for normality. The difference between the time to registration between institutional and independent ECs was compared using the Mann–Whitney U-test. Comparison of reregistration status of Institutional versus Independent ECs was done using Chi-square statistics. All analyses were performed at 5% significance using Microsoft Excel® 2016. A total of n = 1268 ECs were registered with CDSCO. Of these n = 1008 (79.5%) were Institutional ECs, n = 256 (20.18%) were independent ECs and four applications were rejected. A total of 499/1268 (39.4%) ECs were reregistered of which 449/499 (90%) were institutional and 50/499 (10%) were independent. Of the 1268 ECs, data contained in 167/1268 (13.1%) documents could not be analyzed for dates of reregistration because of various reasons, as summarized in [Figure 1]. Thus, a total of 1101 documents were available for further analysis related to reregistration and the distribution between institutional and independent ECs is also summarized in [Figure 1]. Institutional ECs were five times more likely to be reregistered with CDSCO relative to independent ECs (cOR 4.52 [3.12, 6.54], P < 0.0001). A total number of 233 applications were received by NABH for accreditation. Of these, 15 ECs are accredited as of now. The state-wise distribution of initially registered ECs is shown in [Figure 2]a. The state of Maharashtra had the highest number of registered ECs at 290/1268 (22.9%) while the states of the northeast region (14/1268; 1.1%) and Andaman and Nicobar Islands (1/1268; 0.07%) have the least number of registered ECs. 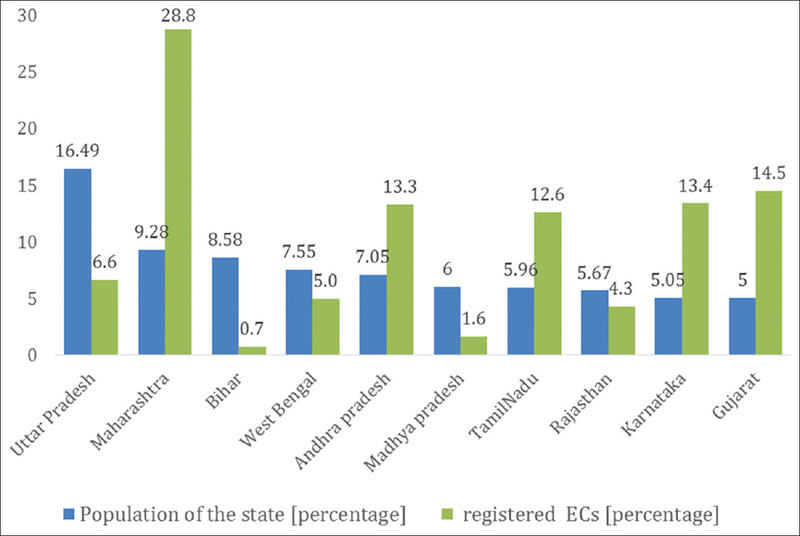 The state-wise distribution of reregistered ECs is shown in [Figure 2]b. Maharashtra leads the list of states in the number of ECs reregistered at 130/499 (26.1%), whereas out of the five eligible ECs in the North East region only two are reregistered. The EC in Andaman and Nicobar Islands is not yet eligible for reregistration. The median time (range) required for registration for institutional ECs was 66.5 (2–1269) days while Independent ECs required 153 (22–822) days for initial registration (P < 0.0001). The time required for reregistration could not be measured as majority of the approval letters of reregistration of ECs did not provide the date of application. The state of Maharashtra with 9.28% of the country's population had 28.8% of registered ECs in the country. The state of Bihar that has a similar population proportion (8.5%) but has only 0.7% of the registered ECs. The population (percentage) of representative states (highly populated) and registered ECs (percentage) is depicted in [Figure 3]. The total number of regulatory studies registered in the CTRI between January 2013 and February 28 2018 were 3689 of which Maharashtra had the highest number (n = 772/3689; 20.9%). In states like Delhi and Bihar, ten and nine regulatory clinical trials, respectively, were overseen by each EC, whereas this ratio was two to four in states such as Maharashtra, Kerala, and Madhya Pradesh. 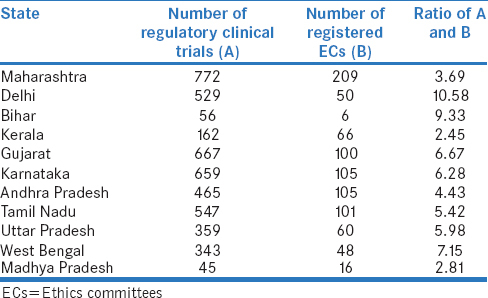 The comparison of number of regulatory trials to registered Institutional ECs in major states across the country is shown in [Table 1]. A total of n = 494 medical colleges are currently recognized by the MCI in the country for PG education. In Sikkim, Meghalaya, and Goa all the MCI recognized medical colleges have registered ECs (n = 1 each). However, the states of Karnataka, Maharashtra, Bihar, UP, Assam, and Haryana have far fewer medical college ECs registered (for example, in Bihar which has 13 recognized medical colleges only one medical college EC is registered). [Table 2] summarizes the numbers of MCI recognized medical colleges and the number of medical colleges with registered ECs across the states in India. 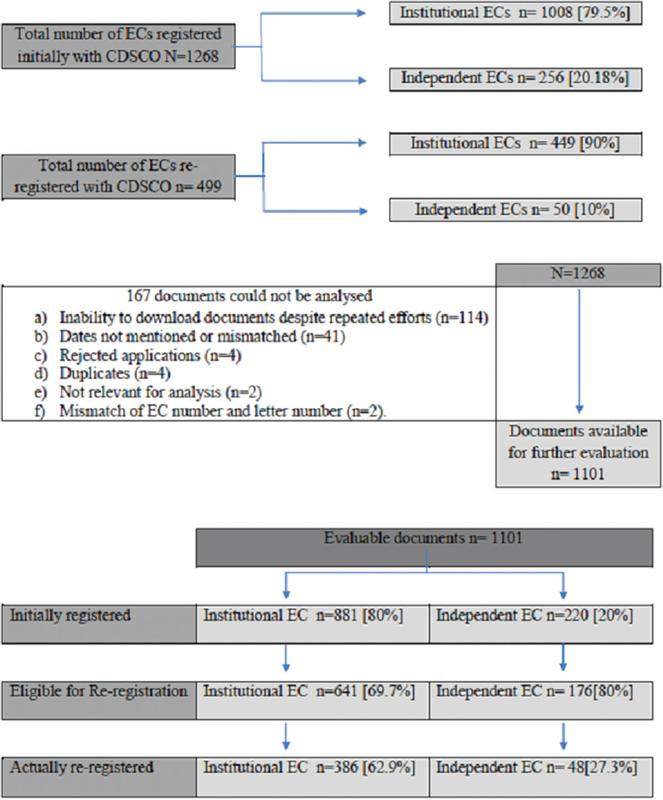 The study on the registration and accreditation status of ECs in India found that 80% of registered ECs are institutional (who are permitted to oversee the regulatory clinical research along with academic studies of an institute) whereas the remaining 20% are IECs (which are allowed to only oversee bioavailability/bioequivalence (BA/BE) studies) with a mere 7% (all institutional ECs) accredited with the NABH. Along with regulatory clinical trials the total responsibility of overseeing academic clinical trials now lies only with institutional ECs without co-supervision by the regulator. This further highlights the need for registration of institutional ECs – and a total of 1008 registered institutional ECs does not reflect the total number of ECs that exist in the country. Interestingly, we found as many as 167/1268 registration documents could not be assessed for the date of registration due to which we were unable to assess eligibility for reregistration, for various reasons including majorly an inability to download these documents. This suggests an incompleteness of the database and implies a need for a timely update of the database to allow for complete transparency of the process. More (63%) of the institutional ECs, which were eligible for reregistration was actually reregistered, whereas only 27% of the eligible independent ECs were reregistered. This may be because of the tremendous documentation required (which needs an investment of time and money as well as training) and lack of fair incentives to do so. Accreditation of only 7% ECs with the NABH over a period of 10 months points toward a slow process of accreditation along with probably a lack of motivation of ECs toward getting this done. This could be attributed to a lack of workforce, the fact that accreditation is a voluntary self-improvement process and a large study overload with most ECs. In view of this, the CDSCO should conduct inspections of ECs that oversee regulatory trials as well as others (that oversee academic trials) to ensure greater adherence to regulations and maintenance of a uniform standard of functioning. 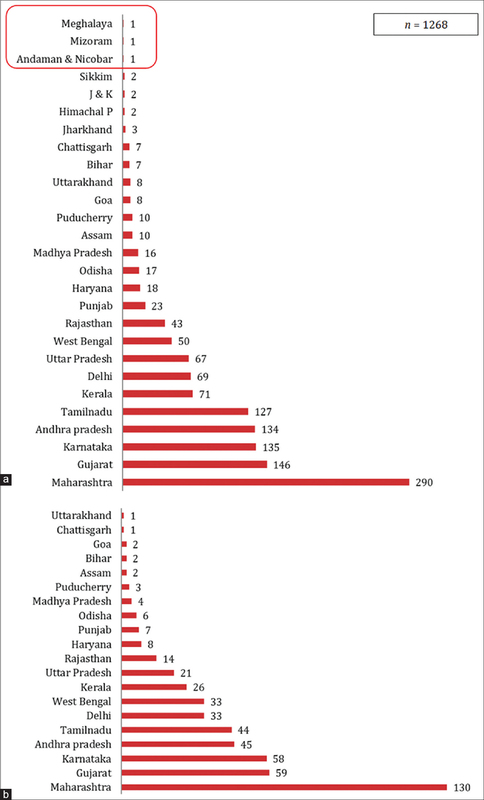 The skewed distribution of initially as well as reregistered ECs across the various states of the country suggests just like a skewed distribution of access to health care facilities  and medical teaching institutes, the concentration of registered ECs in certain states suggests an improper distribution of clinical trials in the country. This has great ethical implications as access to research is as important as access to health care particularly for orphan diseases. The licensing authority appears to favor IECs based on the finding of a statistically significantly greater time to registration for an independent EC compared to an institutional EC. This is possibly also due to the greater efforts and time needed to check the independent EC documentation as they do not have an institutional oversight. However, IECs could play an important role in protecting the rights of participants in BA/BE studies which carry with them several ethical challenges including participant recruitment strategies and informed consent procedures. Independent ECs also oversee nonregulatory studies conducted in smaller clinics and nursing homes which are not BA/BE in nature and their registration with the CDSCO is also desired to happen as fast as institutional committees to promote such type of clinical research important for the population of India. From observations of the present study, it is evident that ECs in certain states are overburdened with the number of regulatory clinical trials they oversee. This might be due to more number of clinical trials being registered in certain states owing to the availability of good quality of healthcare and trained investigators in those states such as Maharashtra, Karnataka, New Delhi, and Gujarat. However, there is a need for registered and hence empowered ECs appropriate to the number of clinical trials permitted in the state. MCI sets uniform standards of higher education in medicine and recognition of medical qualification in India and abroad. MCI recognized PG medical colleges need to be registered ECs to oversee PG theses apart from clinical trials and other academic research. The current scenario in Bihar with only 1 out of 13 of MCI recognized medical college having a registered EC, puts academic research on the radar. In the world's most populated democracy, with increasing clinical research, empowered ECs are the need of the hour. ECs play a great role in the quality of clinical research. Timely reregistration of both institutional as well as independent EC should be encouraged. To strengthen the functioning of ECs and to harmonize quality, ethical oversight of clinical research in the country, NABH accreditation should be stimulated. Available from: https://www.icmr.nic.in/guidelines/ICMR_Ethical_Guidelines_2017.pdf. [Last accessed on 2018 Feb 28]. Available from: http://www.cdsco.nic.in/writereaddata/G.S.R%2072(E)%20dated%2008.02.2013.pdf. [Last accessed on 2018 Feb 28]. Available from: http://www.cdsco.nic.in/writereaddata/Report_of_Dr_Ranjit_Roy.pdf. [Last accessed on 2018 Feb 28]. Thatte UM, Bavdekar SB. Clinical research in India: Great expectations? J Postgrad Med 2008;54:318-23. John TJ, Dandona L, Sharma VP, Kakkar M. Continuing challenge of infectious diseases in India. Lancet 2011;377:252-69. Available from: https://www.mciindia.org/CMS/about-mci/introduction. [Last accessed on 2018 Feb 28]. Available from: https://www.mohfw.gov.in/sites/default/files/Rare%20Diseases%20Policy%20FINAL.pdf. [Last accessed on 2018 Feb 28]. Available from: https://www.wma.net/wp-content/uploads/2016/11/DoH-Oct2013-JAMA.pdf. [Last accessed on 2018 Jun 28]. Bhide SS, Katkar JV, Maurya M, Gogtay NJ, Thatte UM. An audit of the approval letters issued by drugs controller general of India to ethics committees in India. Perspect Clin Res 2016;7:165-7. Available from: http://www.healthdata.org/sites/default/files/files/Bihar_Disease_Burden_Profile%5B1%5D.pdf. [Last accessed on 2018 Jun 28]. Kumari R, Joshi PL. A review of Japanese encephalitis in Uttar Pradesh, India. WHO South East Asia J Public Health 2012;1:374-95.